Gardeners get antsy as March rolls in. The days are getting longer, buds start to swell on the trees outdoors and houseplants start to perk up. Yet outdoors, there may still be snow on the ground and, if not, there is still a great risk of frost in many regions. Isn’t there something they could be doing? Yes, there is: they can start sowing the seeds for their summer gardens indoors. Mostly fast-growing plants like annuals and vegetables. And tomatoes are particularly easy. Experienced gardeners already know how to do this and pretty much already have everything they need on hand. If you’re just getting started, though, it’s probably easiest to buy new materials: a plastic tray, an assorted clear plastic dome and enough 3-inch pots to fill the tray, plus seed starting mix. Or you can recuperate a clear plastic container to use as your tray and dome, the kind supermarkets sell muffins in. You’ll also need a pack of tomato seeds. Do you like cherry tomatoes, slicing tomatoes or paste tomatoes? Red, pink, yellow, orange or black? Early (so you can beat your neighbors) or mid-season (they give more tomatoes)? Small plants for a patio container (determinate tomatoes) or huge clamberers that will produce all summer (indeterminate tomatoes)? You can find tomato seeds in any garden center, even most hardware stores, but for a greater choice, consult an on-line seed catalog. Gather your materials ahead of time so you’ll be ready when the time comes to sow your tomato seeds. 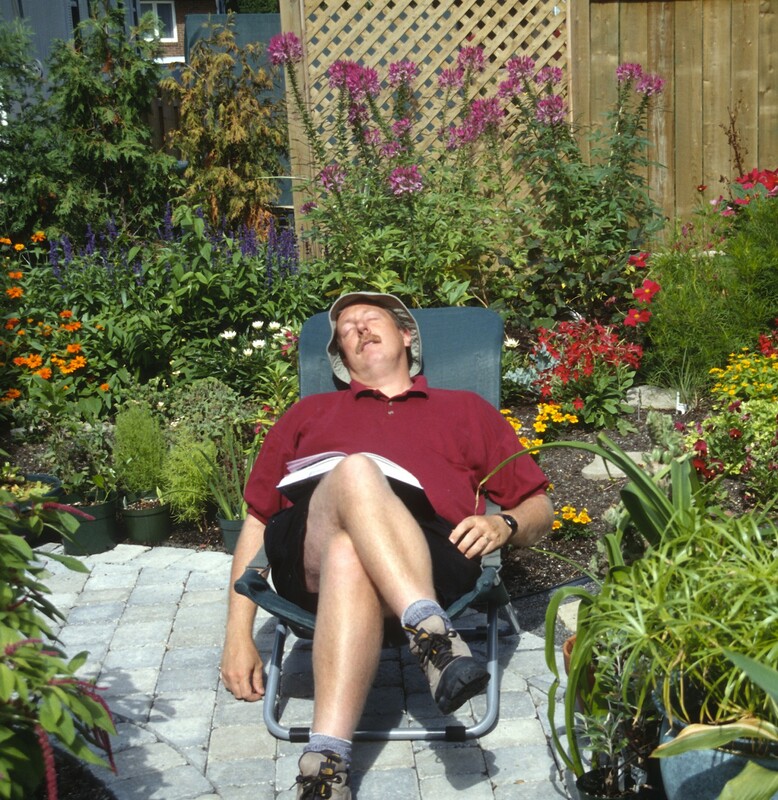 Ill.: Claire Tourigny, from the book Les idées du jardinier paresseux: Semis. Gather your materials … and wait for the right moment. Tomatoes should be sown indoors 6 to 8 weeks before the last frost, never any earlier. That can be as early as February in mild climates and as late as early May in very cold ones. Pour soil into a large bowl or pail and add tepid water, mixing the water in with a large spoon. You want the mix to be just moist, not soaking wet. Spoon the moist soil into your pots and even out with the spoon. With a pencil or pen, piece a hole in the soil in the middle of the pot to a depth of 5 mm. Cover the hole with soil and mist to settle it. Place the pots on the tray and cover with the dome. Place the try in a warm spot (72-90˚F/21 to 32˚C) with good light, but not full sun (not yet!). When the seeds germinate, in about 6 to 8 days, remove the dome and move the tray to the sunniest spot you have. A south window would be perfect. Cut off any extra seedlings with scissors. You want only one plant per pot. When the soil turns pale, that means it’s drying out. Water by pouring tepid water into the tray and letting the plants soak up the moisture. Pour out any surplus 15 minutes later. Give the tray a quarter turn once or twice a week to keep the plants from leaning towards the light. When nights outdoors warm up, remaining above 50˚F/10˚C at night, start acclimatizing the plants to outdoor conditions: 3 days in the shade, 3 days in partial shade, 3 days in full sun. Now plant out in a sunny spot in rich, well-drained moist soil, either in the garden or in a large container. Throughout the summer, water as needed, fertilize every 2 weeks with an all-purpose soluble fertilizer, stake if necessary (determinate tomatoes may not need staking) … and don’t forget to harvest the fruits of your labor!